L-R, Dr. Bill Trout, Holt Messerly, Claudia Tucker, Jeff Taylor, Mike Rucker and “Thomas Jefferson”. Claudia Tucker, Chairwoman of the Amherst County Board of Supervisors at Amherst County Batteau Day, June 10, 2017. 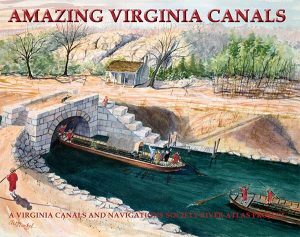 In 1775 an entrepreneur, agriculturalist and businessman named Anthony Rucker [and his brother Benjamin] saw the need to develop a way to ship larger and heavier quantities of goods on the James River. At this time this was a lengthy and unreliable mode of transport. Mr. Rucker [and his brother] designed and built the very first James River Batteau. They could navigate the James and work thru the rapids, boulders and shallow water. They could carry almost 10K pounds of goods while drafting on 12-14 inches of water. Mr. Rucker [and his brother] changed commerce and agriculture, allowing Central Virginia to compete in a meaningful way with farmers and others closer to the more highly populated area of Richmond. Coming from a farming family, I have a very personal understanding of his contributions to the Commonwealth of Virginia. We are here to again thank the Rucker Family for giving back to Amherst County. 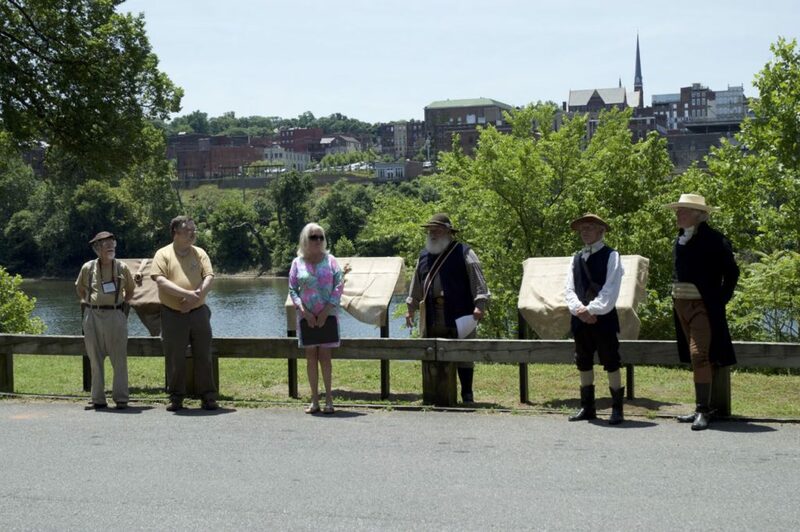 I am in awe of the time and dedication that this family has put into preserving their history – – because the Rucker Family history is Amherst County history. They have tirelessly researched, spending their own money to ensure that our history is appropriately and accurately preserved. Others could talk about their impact on the County but the Ruckers are making contributions that will ensure that future generations will enjoy this piece of history and for that we are forever grateful. 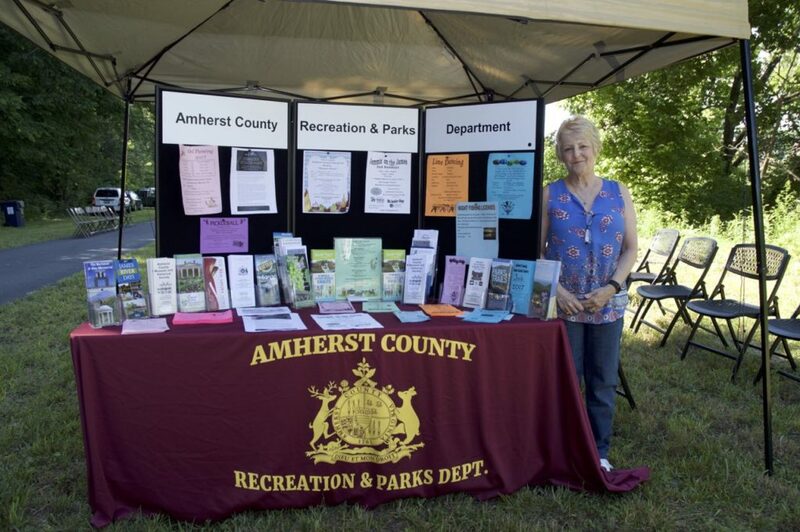 This is a true partnership between an Amherst Family and Amherst County. I’m here to speak the words but the entire county and our residents thank you for your past and present dedication. The signs say it all and they are here because you had the perseverance to help the board of Supervisors understand the significance. Government does not always act quickly but I’m so proud to be a part of this Board and the partnership that we have established. Again, on behalf of the Amherst County Board of Supervisors, thank you. Editors Note: The statement above is corrected in [brackets] to ensure that credit for the invention of the James River Batteau be given equally to brothers Benjamin and Anthony Rucker. 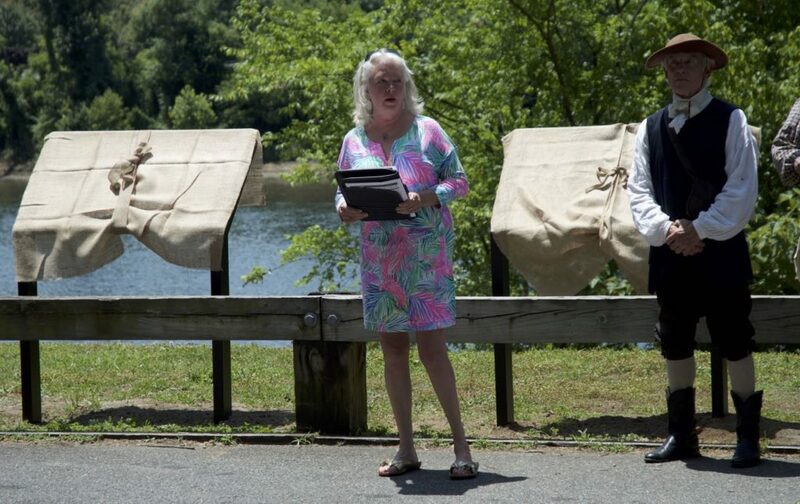 The Rucker Family was in attendance for the revealing of three new historical signs at Rucker Landing inside River’s Edge Park in Amherst County, Virginia on June 10, 2017. Mike Rucker (second from right above) worked very hard on the design and approval of these three new signs. Dr. Bill Trout unveiled the first sign, then Holt Messerly the second and “Thomas Jefferson” the third sign. 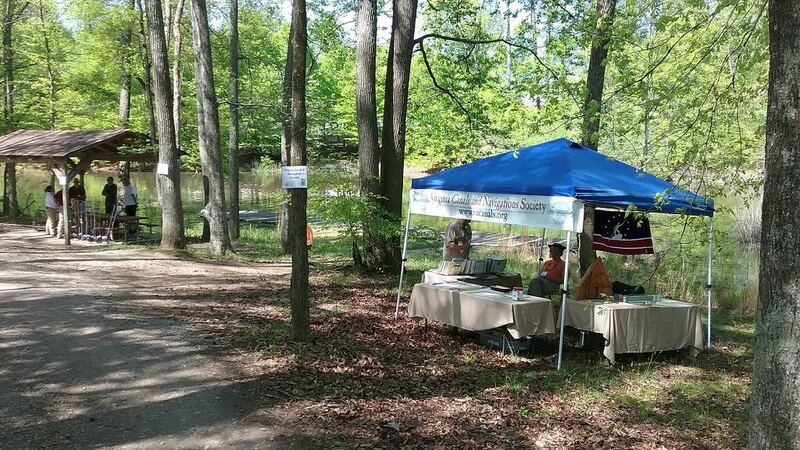 There was a festival down the park walk way with various vendors and craftsmen. The batteau “Lizzie Langley” gave the Channel 13 news reporter a ride on the batteau. The batteau Anthony Rucker was also on display near the top of the boat ramp “Rucker Landing”. To see all the photos of this event click here.